Until five years ago Old Town Lewisville sat as an aging downtown suffering from a population shift to the west and a lack of entertainment and public amenities. As part of the city of Lewisville’s plan to revitalize Old Town, several residential projects are planned for the downtown area this year. Economic Development Director Nika Reinecke said adding more housing options will increase Old Town’s vitality. In recent years the city of Lewisville has added public facilities, parks and open spaces, and pedestrian access improvements as well as more shopping and dining options, all of which have made Old Town more of a destination, according to city officials. Community Relations and Tourism Director James Kunke said the city realized a performing arts theater, new restaurants and other entertainment options on their own were not enough to make Old Town successful. Kunke said there are several new residential projects in the works that will bring hundreds of new people to Old Town. Behind City Hall there are new brownstones being constructed on Walters Street, and just south of Elm Street there is a mixed-use development being built. Additionally just north of Old Town there is a single-family residential project underway called Legacy Pointe. Kunke said he believes the new residential units will also help attract new restaurants and retail. This year Kunke said J2 Steakhouse will open in the former Lewisville Feed Mill, and new restaurants are expected to emerge in the former Chasin Tail BBQ and Elke’s Beer Haus buildings. Ronda and Randy Owens, the owners of The Perc Coffeehouse, purchased the Elke’s Beer Haus building. As a Lewisville native, Ronda Owens said she hopes Old Town will become a destination place for the community. 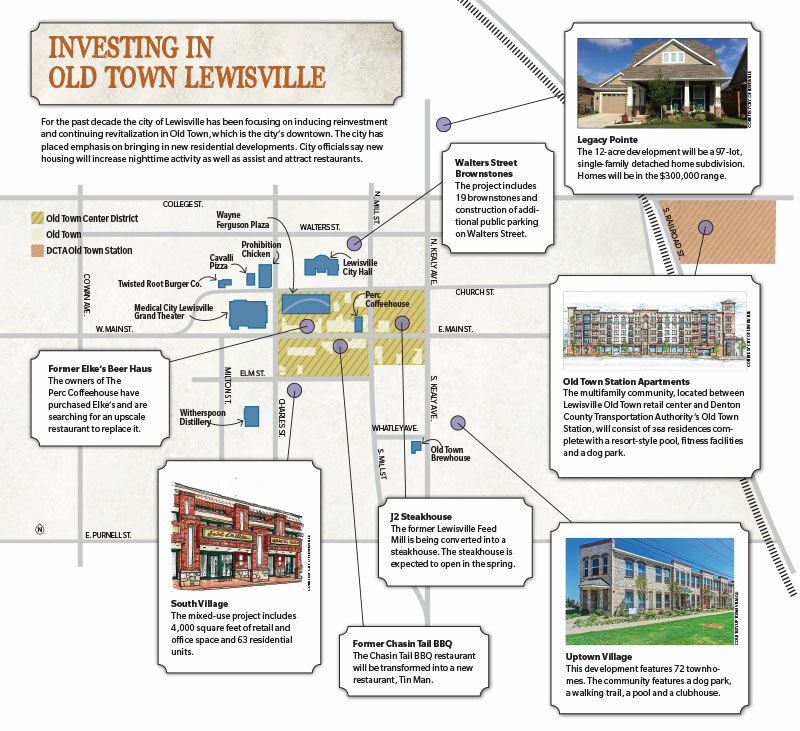 Reinecke said Lewisville has prioritized public investment in Old Town during the past decade, and that includes a major face-lift of Main. Reinecke said the city received a $3 million grant to improve Old Town Main Street all the way down to the Old Town train station. She said the city has only improved Main down to Mill Street as of yet. “[The rest of the project] was delayed until the Valley Ridge extension was complete so people can take Valley Ridge and have that connection while we do construction on Main Street,” she said. Reconstruction of Main from Mill to the Old Town train station is expected to begin in late February or March and be completed in 2019. Improvements will include wide sidewalks, on-street parking, bike lanes, trees and benches. Reinecke said this project will enhance walkability in Old Town and connect the entertainment district with the A-train station. “It’s a short walk from the station to downtown, but because it’s not a cohesive sidewalk and it’s really not a pretty walk, a lot of people don’t want to walk,” she said. The city will also improve Mill with the same look from College Street to Purnell Street. Realizing that Old Town has accrued more visitor-enticing attractions, Kunke said the city has decided to launch a two-year visitor marketing plan. Kunke said the city is in the process of creating a website and social media channels dedicated to Old Town. The marketing plan is intended to attract people from outside of Lewisville and also change residents’ perception of Old Town. Kunke said this is likely due to the fact that there was indeed nothing to do in Old Town a decade ago. He added he hopes this marketing plan can draw some of those residents back in.